This beautiful burled walnut baby grand will be refinished in a stain of your choice and mechanically restored. Includes a matching bench. 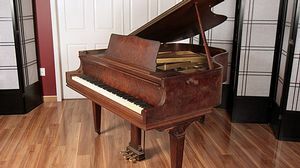 Serial #: 121747 Length: 5'2"
By clicking the "Place Order" button you agree to make a $500 refundable deposit for this piano. A Lindeblad representatvie will contact you to confirm the details for the customization, shipping and final payment for this piano.